(Partial acceptable use policy...for complete policy, click the link above. )The District of Waupaca Network and the Internet represents a significant change in the way information will be used and communicated. All of the problems and concerns with the advent of this technology and its implementation cannot be anticipated. The following guidelines attempt to deal with the known and anticipated concerns in a manner consistent with current district practices and policies. 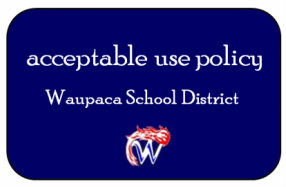 • Do not tie up the District of Waupaca Network with non-school related activities. games on the District of Waupaca Network or the Internet. • Do not download files without permission. • Do not download files for personnal use. • Do not print items for personal use. • Do not share your network password or use another's password. • Do not install programs without permission. • Do not register for any on-line or real-time subscription/data services that do not have educational value. • Follow proper procedure for using district resources (hardware, software, and services) off school grounds. • Close programs that are not being used. • Keep personal directories organized (delete files that are no longer needed). • Use print resources responsibly (no classroom sets, use cut and paste). • Log-off properly when finished. • Properly power-down equipment when appropriate. Digital tools offer you great opportunity to explore, to create, and and connect. Like Voltaire's quote, the great power of the Internet requires the you to take responsibility. Learn about great new digital tools, copyright, and great photo and video resources.